Tozo is located in the eastern part of Fukui, there is a clear stream of nine horses Yongcheon that withholding the Mt. Hakusan to the north, clear and cold Yoshimi of the subsoil water is the water source pond of Fukui City, it has received a great benefit You. To the west Choshoji precincts near Higashifujishima the town, there is also Fujishima Castle monument of the Muromachi period, it is built, surrounded by beautiful countryside of historical ruins remaining air. Since Funaki brewing 1866 founding, water quality first motto is, the subsoil water of nine horses Yongcheon is elected than 150m underground, rice, five hundred of the preferred rice from the fertile countryside of the local Fukui Plain thousands encouragement to the brewing of good quality rice stone, etc., mainly to pure rice sake sake of over throat that taste and the refreshing of the US, we have been launched local, in the Kansai and Kanto. Features of liquor quality of our elephants, in quality of liquor to the refreshing drink port and mellow taste, easy to drink sake. Although habit might not satisfactory feel since there is no, compatibility of cuisine is also good, I think that especially fit to fish to be representative of Fukui. Also in stocks, "Echizen" We also aligned "north of the show" brand to be representative and the local "Kunitomi Naruki of fortune". This brewery (kura) is located in the eastern part of the city of Fukui. Situated to the north of the brewery, the sacred mountain Hakusan is the source of the Kuzuryu River, and Fukui is blessed by the crystal clear subsoil flow of high-quality water that the river provides. The brewery is in a rural district featuring clean air and many historic sites, such as the remains of a Muromachi period (1333-1568) castle (Fujishima Castle) located on the grounds of Nishichoushou-ji temple in the nearby district of Higashifujishima-cho. Established around 1866, the brewery's current head is the fourth generation to take the professional name 舟木三右衛門. In addition to begin the first person to brew ginjo sake in Fukui Prefecture, he also continues to be enthusiastically involved in researching kura technology and equipment. Following a "quality first" motto from the beginning, for its water the brewery extracts subsoil water of the Kuzuryu River from a depth of 150 meters, and for its rice it uses varieties that are considered best for sake brewing (such as Gohyakumangoku) and that are gown on the fertile farm lands of the Fukui plain. The result is the brewery's primary products: junmai ginjo sake with the umami of rice and excellent smoothness. 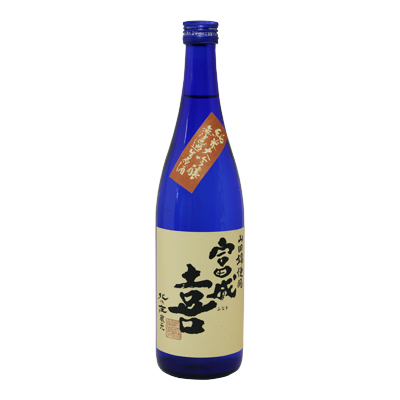 The distinctive features of this brewery's sake are its refreshing taste and mellow feel in the mouth. These are easy-to-drink sake varieties that go well with many foods ,particularly side dishes of fish and shellfish. In addition to the brands Kitanosho and Wakashika, this brewery produces the Funaki brand sold only to a limited group of customers. The name Kitanosho was selected because the house's family crest, showing three wild geese, resembles the family crest of the famous warlord Katsuie Shibata of Kitanosho. The name Wakashika ("young deer") was selected because deer are symbols of autumn and from ancient times they have been revered as messengers of the gods, and also because the name embodies the youthful energy of young deer as they leap and jump about. Giving priority to locally produced rice, the brewery uses primarily the Gohyakumangoku variety that is a favorite for sake brewing. For daiginjo sake, only Yamadanishiki rice is used. The brewery also sells a junmai sake produced with a "natural" focus by using rice grown with organic fertilizers and low levels of agricultural chemicals. This rice is obtained by contracting for cultivation directly with outstanding farmers. The sacred mountain Hakusan is the source of the Kuzuryu River, and Fukui is blessed by the crystal clear subsoil flow of high-quality water that the river provides. The brewery extracts subsoil water of the Kuzuryu River from a depth of 150 meters. 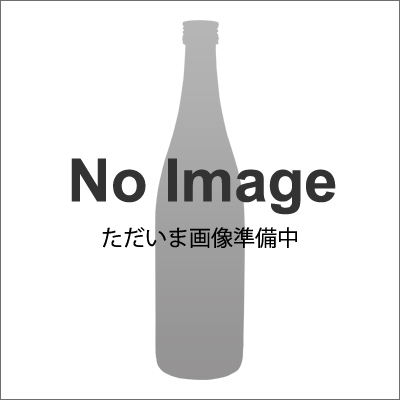 Produced using the brewery's independently developed "kura preserved yeast," this brewery's superior products have won many gold medals in competitions in the Hokuriku region and throughout Japan. We are using the Nishiki Yamada . It is a wine with a light incense of slipping such Nodogoshi . 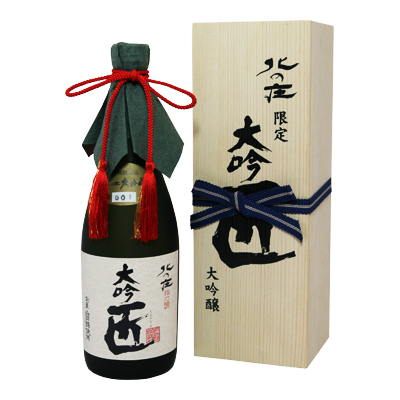 This Daiginjo is handmade by our skilled Toji (master brewer) with meticulous care using only the finest Yamadanishiki rice, milled to 35 percent. Produced in frigid winter weather, every deteil of the process, from pressing to bottling, is precisely monitored to create this masterpiece. 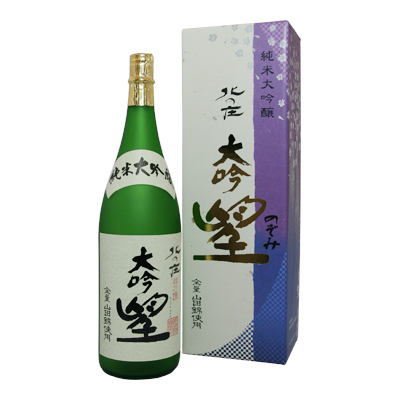 Kitanosho Junamai-Daiginjo "Toji Daigin Nojiri Watokujo"
Using only the finest Yamadanishiki rice exclusively cultivated for this product, 'Nojiri Watokujo' is brewed to fulfil the requirements of sake evaluation competitions. With the rice milled to 40 percent, this is one of the best Junmai Daiginjo we produce. 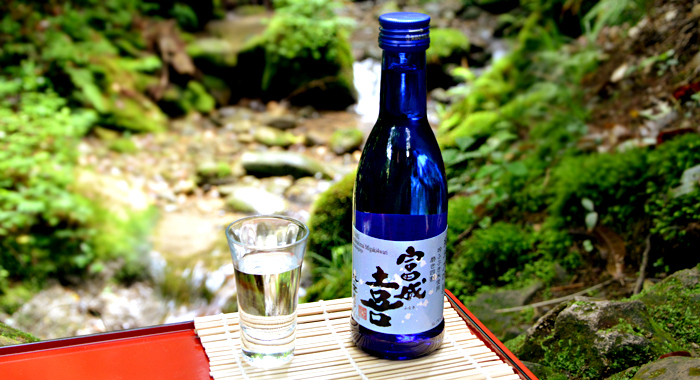 It has a rich fragrance and taste, reflecting our Toji's (master brewer) passion to create the finest sake possible. its slightly bitter and fresh taste goes well with Echizen crab, sweet shrimps and Sashimi (sliced raw fish). A premier clear-type junmai daiginjo with well-balanced full aroma umami, this sake is brewed with the same all-manual techniques used for sake evaluation event entries. It uses only Yamadanishiki rice cultivated under contract and milled at 40%. Kitanosho Junmai Ginjo Sake "Jungin"
This brewery has a well-established reputation for junmai sake. As with daiginjo, utilizing only the core of the sake rice, this jinmai ginjo sake is fermented over a long period at low termperature using kura-preserved yeast to create a refreshing aroma and rice umami. Please enjoy the balance of fragrance and taste. This brewery has a well-established reputation for junmai sake. 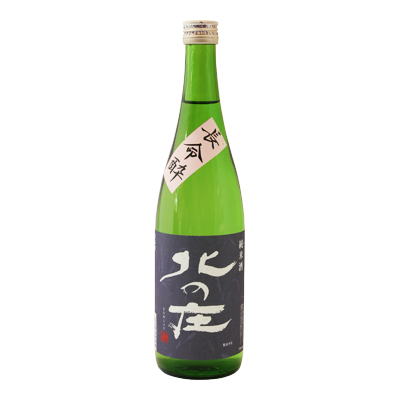 It ferments this sake over a lonf period at low termperature using kura-preserved yeaste to create a rich aroma and rice umami suitable to a junmai product. Please enjoy the satisfying umami-rich taste. 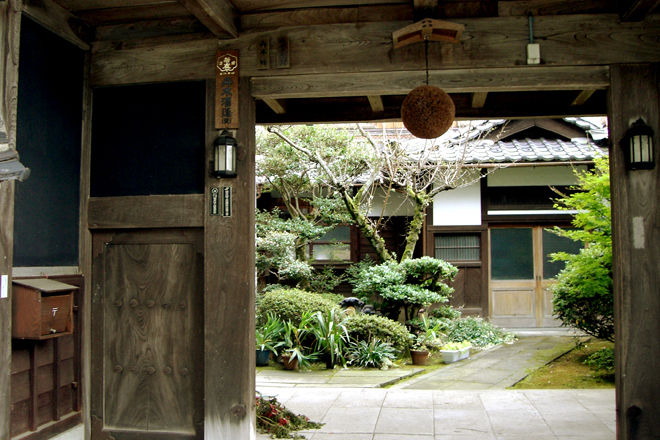 Making lavish use of Yamadanishiki and local Gohyakumangoku rice varieties considered optimal for sake production, time-honored traditional techniques are utilized to brew Kitanosho Ginjo Echizen. 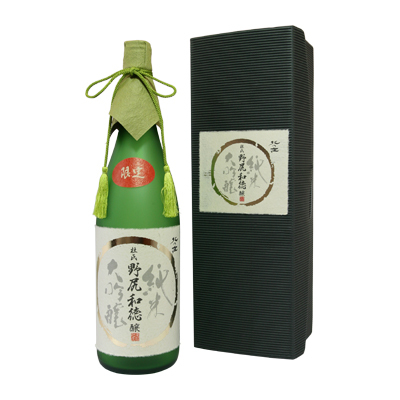 This is a refreshing and dry sake with the soft, fresh fragrances and flavors of Western pears and green bamboo. It is the perfect companion for fish and shellfish of the Japan Sea, such as northern shrimp, Echizen crabs, and sea bream. 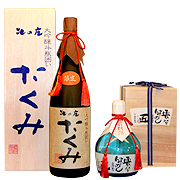 It was given the name "Echizen" as a representative sake of Fukui Prefecture. Using local Fukui rice well-suited to sake production, "Kitanosho Amakuchi-no-sake" is brewed with an invigorating taste that is both sweet and refreshing. 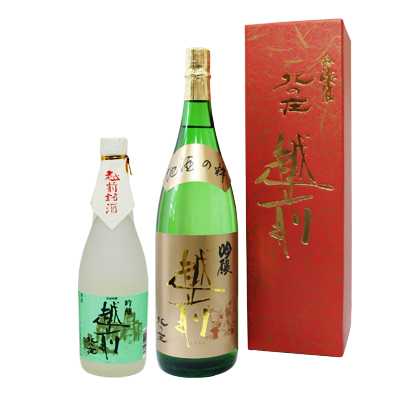 As with the ginjo sake, in his quest for a new kind of taste, Nanbu master brewer 野尻和徳 perfected this superd sake through careful fermentation in the coldest days of winter. 'Funaki', one of our masterpiece products, uses only the finest Yamadanishiki rice, which is best sutited for sake brewing. This sake is pressed unfiltered, then ice-cooled. Just before shipping it is heated for pasteurization, then bottled to preserve the raw, fresh quality. Ripe and mild, yet clear and cool, 'Funaki' is the perfect combination of umami of rice and unfiltered sake taste. 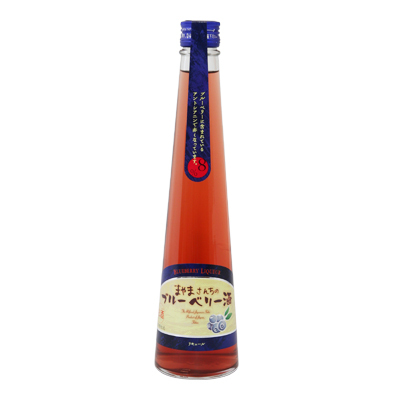 Kitanosho Japanese liqueur "Blueberry Sake"
The sake produced by Funaki-Syuzo Corporation is made from blueberry, harvested in the local Higashifujishima area in Fukui Prefecture, and crystal sugar. 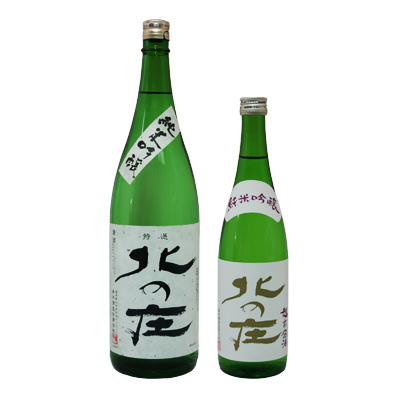 These two ingredents are matured over six months and the sake of rich flavor is bottled. The sake's refreshing sweetness and the sweetness of the rice further accentuates the strong taste of this sake .It is even more delicious when served with lime and carbonated. Blueberries grown locally in the Mayame-cho district of Fukui are fermented for six months with the brewer's own sake. The pigment anthocyanin is responsible for the beautiful color. This sake brings many benefits to those who drink it. It has an easy-drinking alcohol percentage of 8%, and you can enjoy its refreshing taste as an aperitif.